Make a donation and double the impact! Look for registration details on May 1st, 2019. Call TLC for more information 262-767-1478. ONLINE REGISTRATION FOR OUTING NOW AVAILABLE! Community State Bank is gathering gifts for those living at the shelter during this holiday season. A tree will be displayed with wish lists from the moms and children. The tree will be displayed from November 20th until December 18th at the Burlington location. Please consider giving a gift to someone living at the shelter this year! Help spread some Christmas cheer! Mangold Insurance is holding a holiday toy drive for TLC. The toys donated will be gifted to the children who are living at the shelter during this holiday season. New unwrapped toys can be dropped of at Mangold Insurance, Burlington office. The toy drive will from November 10th until November 30th. On August 20, 2017 TLC will hold its 7th Annual Golf Outing. Watch for details. It will be here before you know it. Turn It Up For TLC! Great music for a good cause. July 9th from 1 to 3 pm at the Bottle Shop in Lake Geneva. Enjoy delicious pancakes and a chance to support the local homeless community. 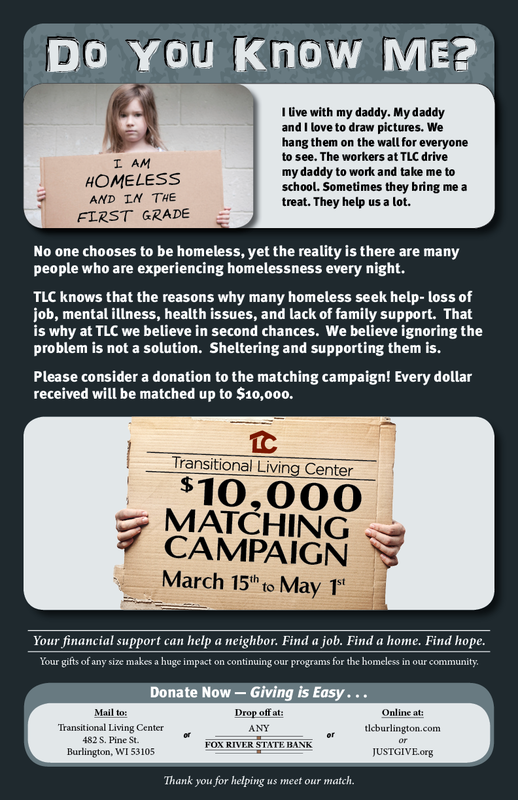 It is with the community's support that TLC has been able to serve the homeless for the past 24 years. We ask for your continued acknowledgment of our program and your generous donations. These donations allow us to develop programming to meet the needs of those we serve. Help us meet our match and help those in need. Donations can be sent to TLC, given online at JUSTGIVE.ORG, or taken to Fox River State Bank. With the holidays fast approaching, TLC's Secret Santa program is up and running. This program is a great way to make a family's holiday brighter and celebrate the true meaning of the season... giving. LifeBridge Collective and Fox River State Bank are sponsoring a charity run/walk for TLC. Join us on the links for a fun day of golf, good food and supporting a great cause.